Are you experiencing these workforce management issues? It’s difficult to confirm that your security officers are at their posts and that they remain there. You find yourself paying for 26 hours of work in a 24-hour day. The process of issuing, replacing, and returning uniforms or equipment is very manual and records are not well maintained. You spend a lot of time working out shift schedules and calculating your employee’s logged hours. It is difficult to calculate the total monthly cost of each security officer. We understand security, we live technology, we love finding solutions. Eldir (Pty) Ltd was formed as a result of a compelling collaboration between Security and Software experts. The company develops and supports solutions designed to manage the lifecycle of personnel and equipment. As an authorised FlowCentric Technologies ISV Partner, Eldir (Pty) Ltd leverage the technical expertise that accompanies this strategic partnership in order to deliver world-class business solutions. Adriaan was a career police officer, considered to be one of the leading officers in the South African Police Special Task Force, before resigning to form his own private security company. Adriaan has extensive experience managing private security companies, guarding services, risk analysis for corporate clients and governments, VIP protection, and investigative services. Adriaan has leveraged his diverse operational knowledge, both on the ground and in the office, to develop the unique digital offering Eldir: Digitised Security Officer (DSO). The application addresses many of the challenges faced by security companies. The Eldir: DSO solution is ideal for organisations intent on competing in a ruthless market. Denis Bensch is CIO at Eldir (Pty) Ltd. Over the last 25 years Denis has designed and developed complex enterprise systems for numerous blue-chip companies. Denis was a career soldier for 13 years in the South African Defence Force (SADF)/South African National Defence Force (SANDF). During this time, he served in the Infantry for three years and concluded his career with rank of Major. Denis leads the product development and innovation team at Eldir (Pty) Ltd. As a technically-minded business strategist, Denis leverages his experience as an international trainer to translate the complexities of technology into a language that business owners can relate to. There is very little software designed specifically to address the needs of senior management in the Security Industry. This means that security companies are either predominantly run as paper-based organisations, or personnel must resort to modifying existing technologies to force a fit. Neither of these approaches are ideal, as they do not provide many opportunities for innovation, data analysis, or strategic cost cutting. Eldir: Digitised Security Officer (DSO) delivers digital transformation software designed for the Security Industry. Understand the total expense of each security officer (including salary, overtime pay, uniform and equipment replacements). 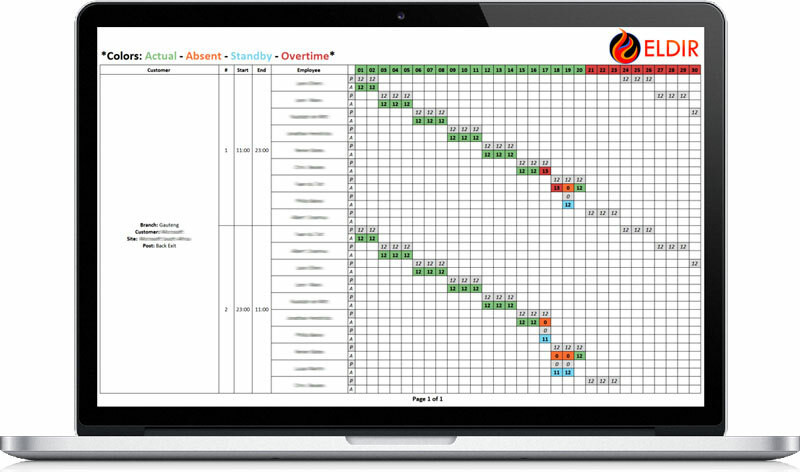 Accurately track and record overtime while eliminating unreliable paper-based practises. Reduce fraud and costly legal disputes with accurate and auditable timekeeping. Know where equipment and uniforms are after the assets are checked out, and effectively manage returns. Manage your customers effectively, ensuring that contracts are updated, and resources are accurately allocated. Understand which customers are profitable and which are not. Management can accurately gauge customer satisfaction and take corrective action if needed. Accurately monitor and manage maintenance and monthly mileage schedules for all your vehicles. Organisations lose millions annually because of ineffective time and attendance management, poor asset tracking, unreliable vehicle maintenance schedules, and expired qualifications. It is essential for companies to accurately manage time and attendance records on behalf of their employees. An effective time keeping solution helps organisations to control overtime, manage tardiness, eliminate payroll fraud, and reduce processing time. When poorly managed an organisation can lose millions of dollars to excessive payments and labour disputes. Poor uniform and equipment management can lead to unnecessary corporate expenses, while an unreliable returns process for uniforms can result in damage to the company’s brand and reputation. Accurately managing the kilometre usage and maintenance of corporate vehicles is challenging, especially when the company has a large fleet. Lack of accurate data can result in unnecessary expenses, overuse and malfunctioning of the cars, or penalties enforced by leasing companies. Ensuring that all employee’s qualifications, such as driver’s licenses and firearm competencies, are accurately recorded and renewed in time prevents delays and potential legal issues. It is very time consuming to proactively manage these competencies using a manual paper-based system. Eldir: Digitised Security Officer (DSO) provides a central, cloud-based solution to these pressing problems. Eldir: DSO is jointly developed by security, process management, and technology professionals to provide security companies with an efficient way to manage their assets, contracts and security officers. The system leverages the power of IoT sensors, modern telecoms, and an award-winning process management platform to deliver a solution that proactively manages the customer’s operations. Eldir: DSO not only enables clients to accurately track human and physical assets while they are in the field, but also manages qualifications, such as driver’s license and firearm competencies, in a proactive way, ensuring that these credentials are accurately recorded and renewed in time. The secure digital solution ensures that company data is centrally managed, and easily assessed by management, while drastically reducing the administrative load on personnel.